A Girl and Her eBooks: Getting Away : A New Adult Romance Story by Amelia Jones - FREEBIE! 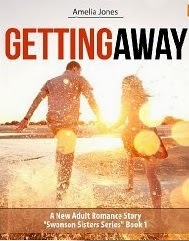 Getting Away : A New Adult Romance Story by Amelia Jones - FREEBIE! Sophie is a talented musician and in her final year of college when she meets Jack in a psychology class they both had to take as part of their degree completion plan. They both come from dysfunctional families and experienced abuse until they left home to forge a better future for themselves. They are both in their final year and are determined not to go home to their respective families after college. Sophie and Jack slowly connect as friends and their friendship deepens as they open up to each other. They decide to settle on a farm just outside of the college town and their pasts forge an unbreakable bond that allows them to move forward and face the future together, Sophie as a music teacher at college and Jack a farmer.